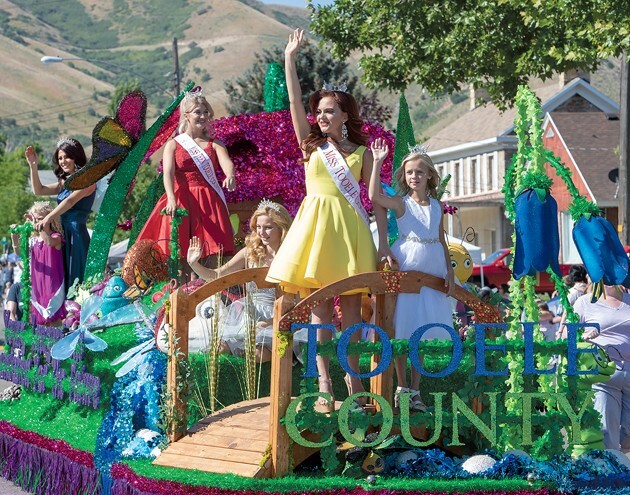 Miss Tooele County Kylee Robinson waves to the crowd from the front of the Tooele County float with Little Miss Tooele County Addison Willden. 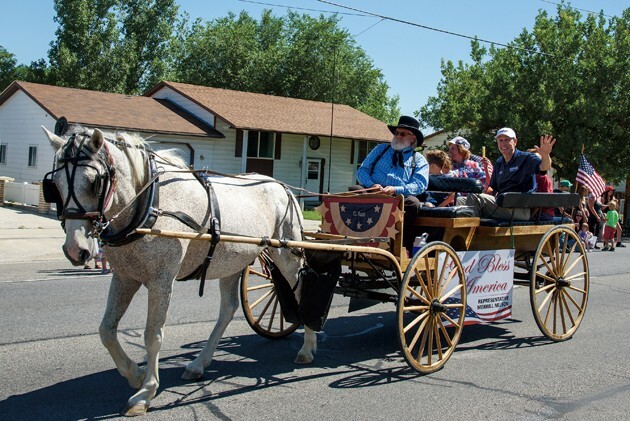 Representative Merrill Nelson and his family ride in the Grantsville parade. 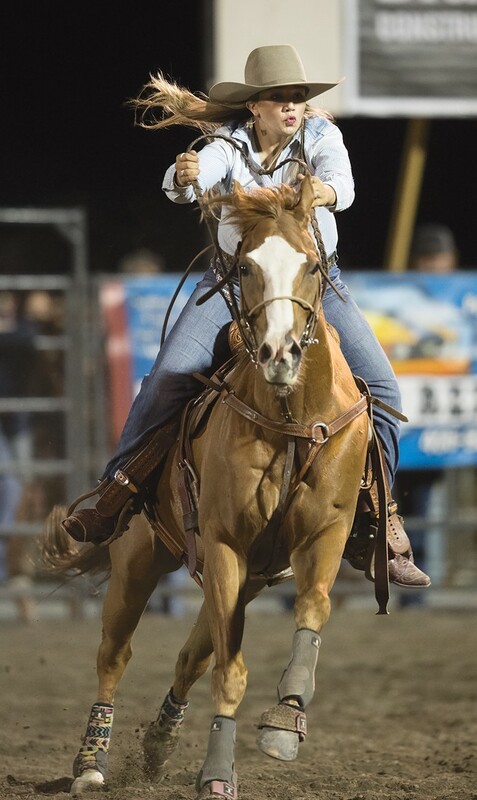 Bliss Bolton from Texas competes in barrel racing at the Bit n’ Spur Rodeo. 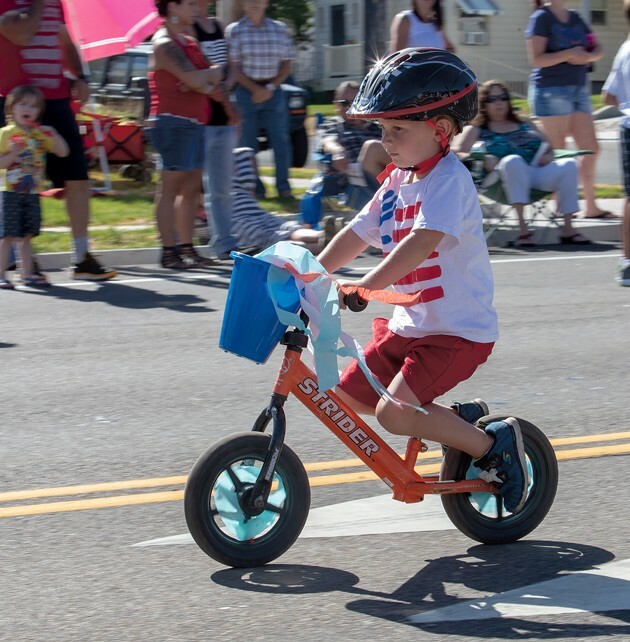 Raiger Burton rides his bike in the parade stopping from time to time to throw candy from his basket. 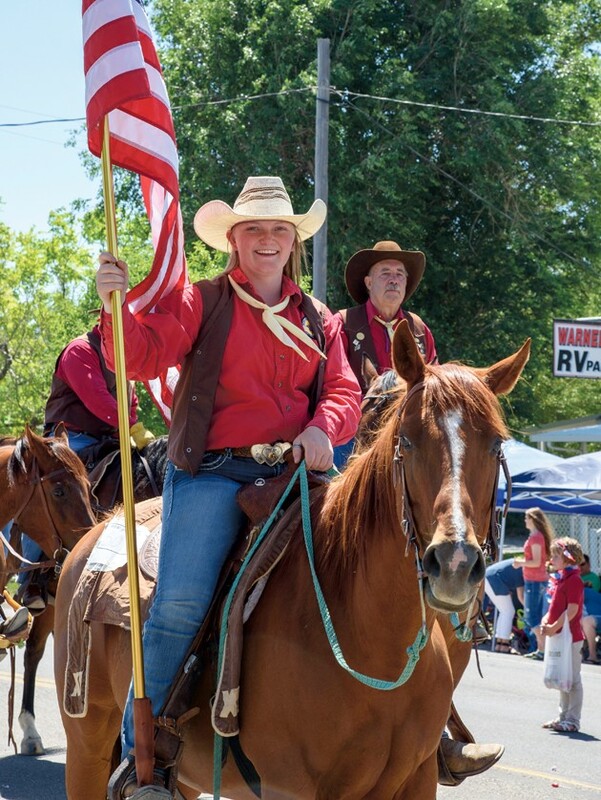 Pony Express rider Savannah Stephens carries the flag at the Grantsville parade. 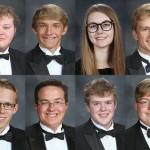 Royce Bowden performs with the Tooele High Marching Band. 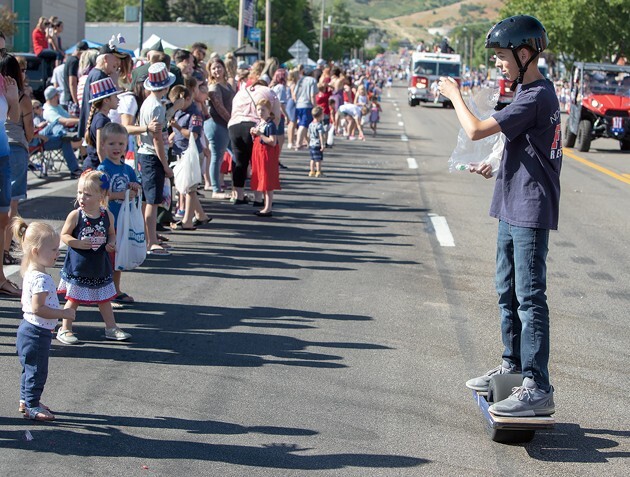 Ethan Willden rides the parade route with North Tooele Fire County District handing out candy to spectators. 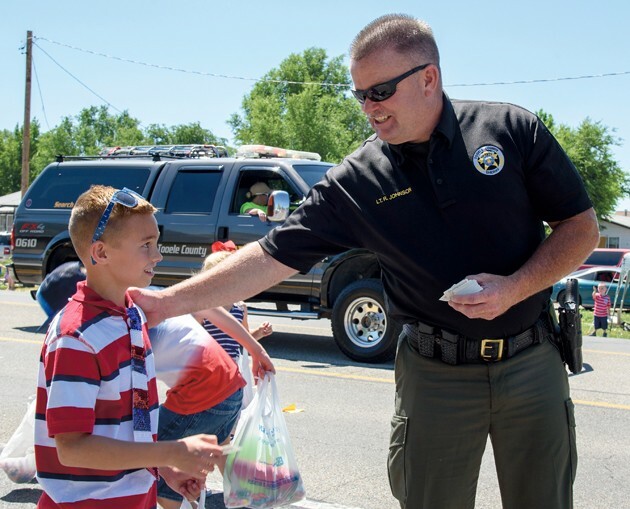 Lt. Ron Johnson of the Tooele County Sheriff’s Department talks with Stockton Haider on the Grantsville parade route. 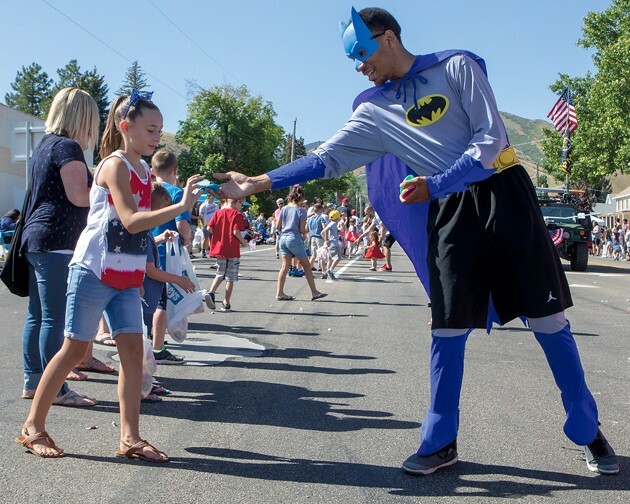 Stephen Lindsey gives Madison Mitchell a goodie during the Tooele parade. 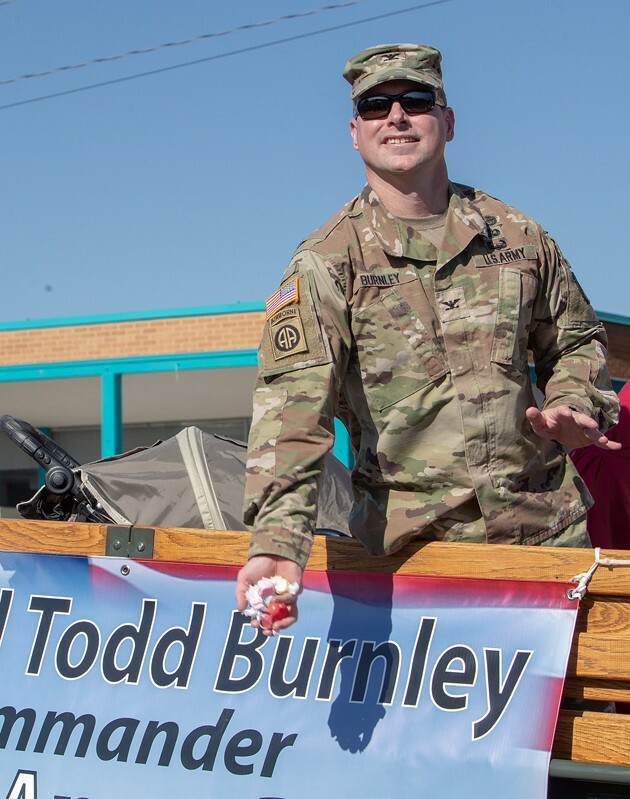 Col. Todd Burnley, Commander of Tooele Army Depot, tosses a handful of candy to the crowd. 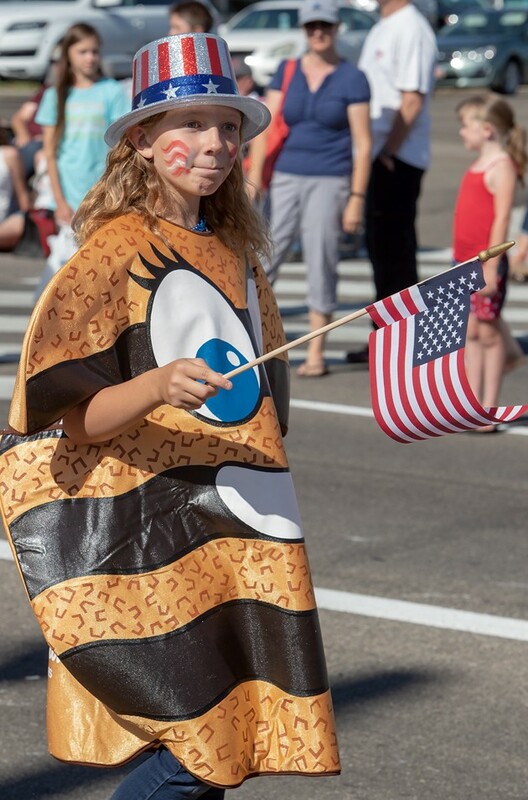 Alex Baker walks with the Girls Scouts dressed as a somosa Girl Scout cookie. 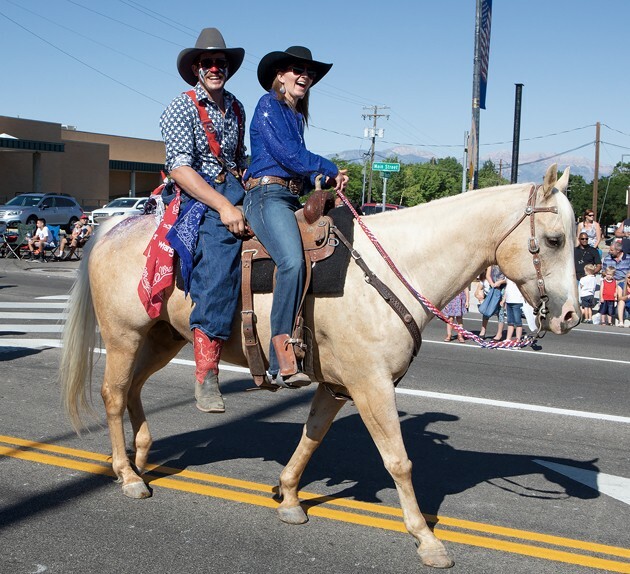 Rodeo clown Sam Lively gets a lift from Bit n’ Spur rider Katie Taylor. 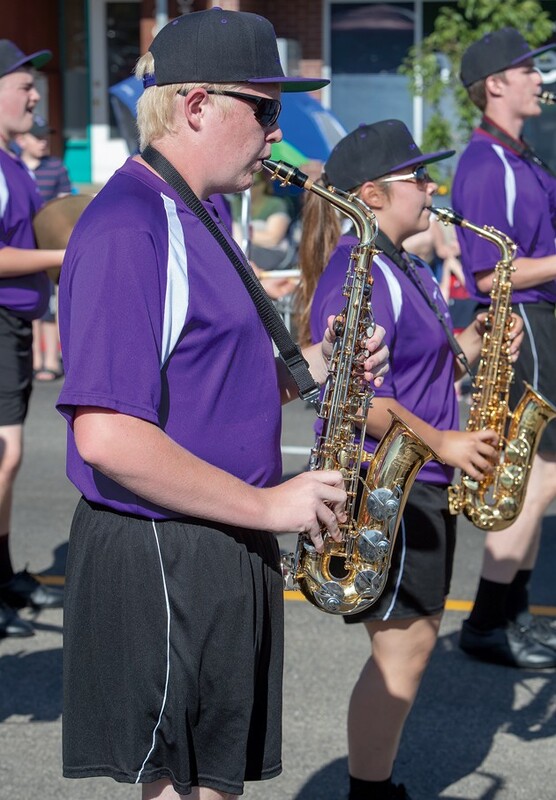 Tooele High School Band Director Jordan Wright interacts with the crowds while the band performs in the parade. 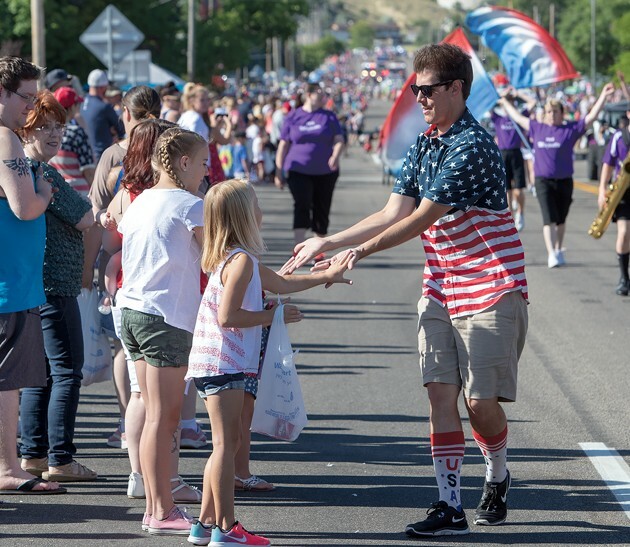 2018 Tooele County 4th of July Fun! 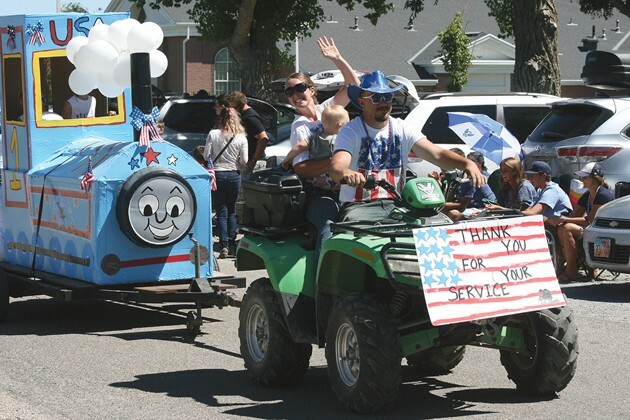 Last week’s Fourth of July festivities across Tooele County celebrated the nation’s 242nd birthday and citizens made sure every event was well-attended. 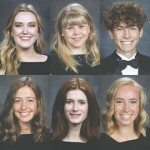 Communities, from Tooele City and Grantsville to Vernon, took one or more days to acknowledge Independence Day with scholarship pageants, parades, rodeos, park activities, concerts and fireworks. 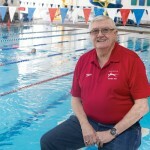 In Vernon, a veteran’s memorial was dedicated by more than 300 citizens and visitors on July 4. 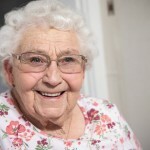 The Kiwanis Club held its annual Freedom 5K in Tooele as part of the Independence Day festivities, while the Barrus Memorial 5K and Grandma Bernadine’s Dusk ’til Dawn Tennis Tournament provided entertainment in Grantsville. 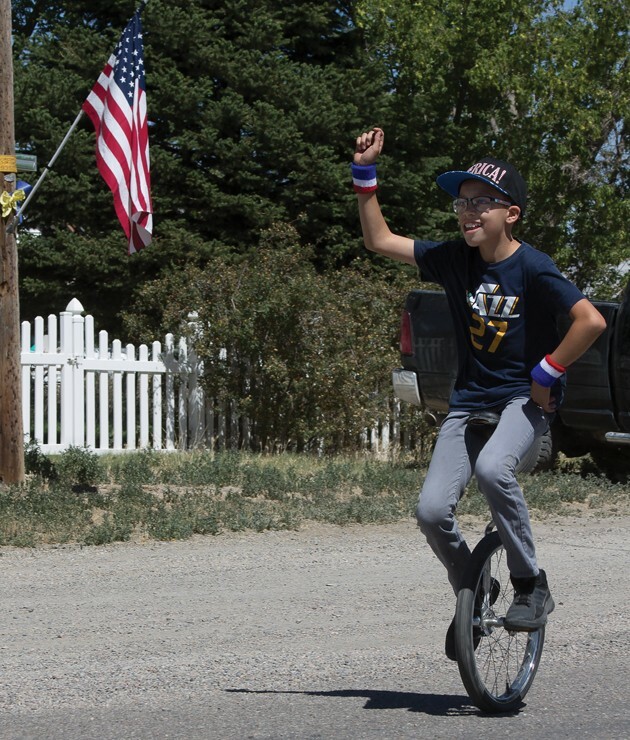 Tooele County citizens are renowned for their patriotism and national pride, as evidenced by today’s Hometown section filled with photographs from last week’s events.